Palm Coast, FL (01/30/13) - Screaming Bee Inc. is pleased to release a new voice-changing product that runs on Mac® computers. 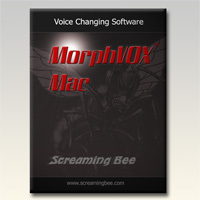 MorphVOX® Mac provides high-quality voice modification to online games, instant messaging, and the multimedia studio. The new release of the software is fully compatible with Mac OS X® 10.6 and higher. Online players can sound like the character they play, whether they choose to be an enormous troll or a tiny pixie. Additional voice, sound and background packs provide even more content for the program. The software can be easily integrated with VoIP solutions such as Skype™ or Google Voice™ allowing customers to modify their voice during any call. MorphVOX Mac can also morph an existing audio file or record a voice directly to file. The software supports many audio formats native to the Mac environment including AIFF, AAC, MP3 and more. Studios that use this tool can save time and potentially thousands of dollars by creating multiple voices from existing stock audio or a single voice talent. MorphVOX is a registered trademark of Screaming Bee Inc. Mac, Macintosh, OS X and Apple are registered trademarks of Apple Inc. Skype is a trademark of Skype Technologies S.A. Google Voice is a trademark of Google Inc.